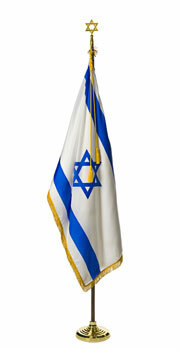 The nylon Israel presentation flag sets are furnished with the finest quality mountings and are suitable for any formal flag presentation. Our deluxe sets contain a beautiful, high gloss 3'x5' Nylon flag with pole hem and fringe, a furniture polished two-piece oak-finish pole that includes a solid brass screw joint, a 8.75" Star of David Ornament, 5"x9' golden yellow cord and tassels, and our deluxe gold-finished Liberty flag stand. Our Presentation Flag Sets are proudly made in the USA.